If you could invite 10 influential people to join your holiday feast, who would you choose? Whether you’re hosting or attending any holiday get-togethers, this time of year is all about connecting with people and sharing conversations. As influencers become increasingly valuable to the viability of brands, there is constant chatter about how to find the right ones. Where do you start? Who will have the most impact for your business? What should you ask for and when? Before you even start asking yourself these questions…you have to put yourself in the influencer’s shoes. In order to do that, you need to understand who they are and what they care about. That’s why I turned to The Many Faces of Influence infographic to bring some context to the wonderful world of influencers, holiday style. Just as there are many types of businesses, whether it be tech, beauty, luxury, or consumer goods, there are also many types of influencers. Which ones would you invite to your holiday feast? Read on to learn about the different types of influencer archetypes, including how to best engage with them and get them to attend your holiday feast. There are influencers and then there are celebrities. Whether someone famous to the public eye or widely well-known in an industry, the Celebrity will draw an audience with their massive reach. The only catch is the cost, as celebrities will charge a fee for an event appearance (which makes sense, as it’s part of their craft). The benefit? You’ll attract other influencers to the party by having a celebrity among the roster. The Authority can’t be bought but may show up around the holidays if you convince them with content. They're interested in substance that brings value to their audience. So give them a preview of the quality of conversations that will happen at the table. How can you help them bring value to their community? There’s nothing more important to the Connector than their own network. Use this to your advantage. Add value by making introductions so they can nurture more relationships. What better way to build connections than at your Holiday table? For the Personal Brand, their name is their equity. If you can find ways to help enhance this influencer’s personal brand, they’ll want to return for holidays to come. But if you hurt their personal brand, there’s no turning back. Chances are, the holiday season analyst will know everything from turkey market opportunity to the future of peppermint-flavored everything. They’ll be eager to attend your feast if you can provide new data and knowledge and give them access to insider insights. It wouldn’t be the holidays without some lively discussion, right? Inviting this influencer to your table means welcoming their opinions, too. The lesson is to never shy away from someone who may disagree with your point of view. The Activist will be happy to join as long as you keep an open mind. The Expert, most likely a renowned author, will be the go-to information source in their field. In order to attract the Expert to your table, you will need to find ways to help them produce content and showcase their expertise. The Insider is someone who is constantly plugged in with respected circles in your industry--and always holds a personal agenda. And, this person may be one of your most influential employees. Turn inside your company for those who influence other employees. You’ll find that they may influence your customers, too. The Disruptor will gladly show up to your festive event if you can fuel their debate with substance. The Disruptor wants to explore uncharted territory, so invite them with an open mind and be ready to think outside the box. The modern journalist can be engaged with an interesting, exclusive, and timely story. However, as traditional PR methods increasingly fall flat, look to building authentic relationships to get the Journalist to your table. Plus, given the impressive roster of influencers (see the nine archetypes above), it’s likely the Journalist won’t want to miss this event. I may be biased, given that I work for an influencer technology company, but I feel an Influencer Holiday Dinner would be one to remember. I’ll have to take my own advice for next year, change things up, and invite some influencers to join me. If you had to choose an influencer-type to invite to your holiday event, which one would you pick? 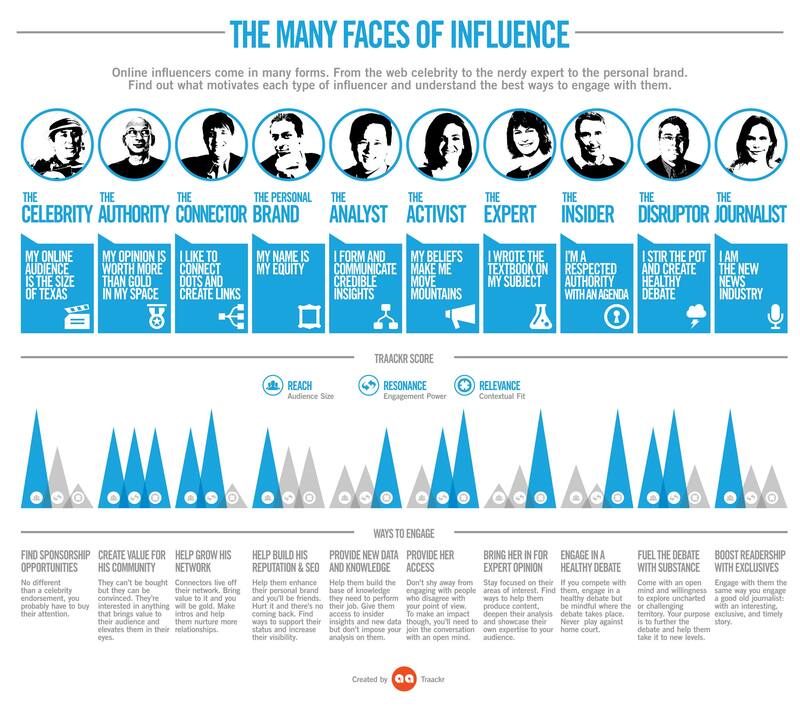 To dive deeper into the different types of influencers, check out The Many Faces of Influence Deck.